In an interview on a Catholic radio program earlier this month, Fr. 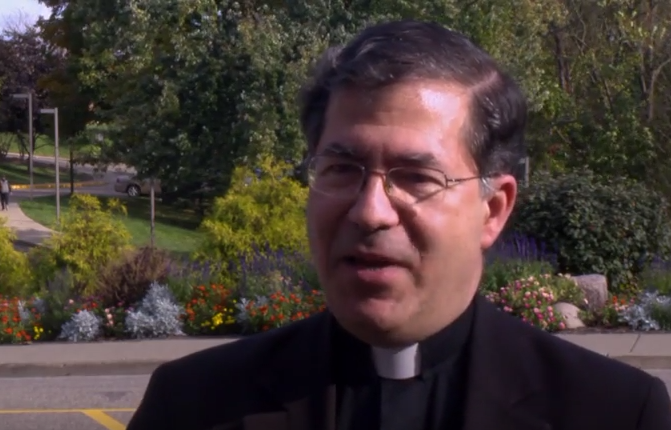 Frank Pavone, the head of Priests for Life, made the case for Donald Trump to a skeptical listener by explaining that while Trump may have the potential to kill people as president—whether it be by deliberately murdering the family members of suspected terrorists or launching a nuclear war—such a fear should be outweighed by Hillary Clinton’s support for the “raging holocaust” of abortion. And then, of course, the final element of the analysis as far as I’m concerned is, are we talking about a potential destruction of the innocent or an actual destruction of the innocent and in what numbers? Right now, we have a raging holocaust going on, and it’s not ‘maybe’ and it’s not ‘potential’ and it’s not ‘maybe we’re going to kill these families’ or ‘maybe we’re going to drop an atomic bomb.’ It’s like several atomic bombs have already gone off on our own soil when it comes to just the sheer numbers. And so, with abortion we’re talking about an actual, daily killing of the innocent as opposed to something that maybe, if we’re analyzing properly what he said, could be a potential killing of the innocent.